Background: Mugua is a common Chinese herbal medicine. There are three main medicinal origin places in China, Xuancheng City Anhui Province, Qijiang District Chongqing City, Yichang City, Hubei Province, and suitable for food origin places Linyi City Shandong Province. Objective: To construct a qualitative analytical method to identify the origin of medicinal Mugua by near infrared spectroscopy (NIRS). Materials and Methods: Partial least squares discriminant analysis (PLSDA) model was established after the Mugua derived from five different origins were preprocessed by the original spectrum. Moreover, the hierarchical cluster analysis was performed. Results: The result showed that PLSDA model was established. According to the relationship of the origins-related important score and wavenumber, and K-mean cluster analysis, the Muguas derived from different origins were effectively identified. Conclusion: NIRS technology can quickly and accurately identify the origin of Mugua, provide a new method and technology for the identification of Chinese medicinal materials. Background: Crataegi fructus is a herbal medicine for strong stomach, sterilization, and alcohol detoxification. Chlorogenic acid and hyperoside are the major compounds in Crataegi fructus. 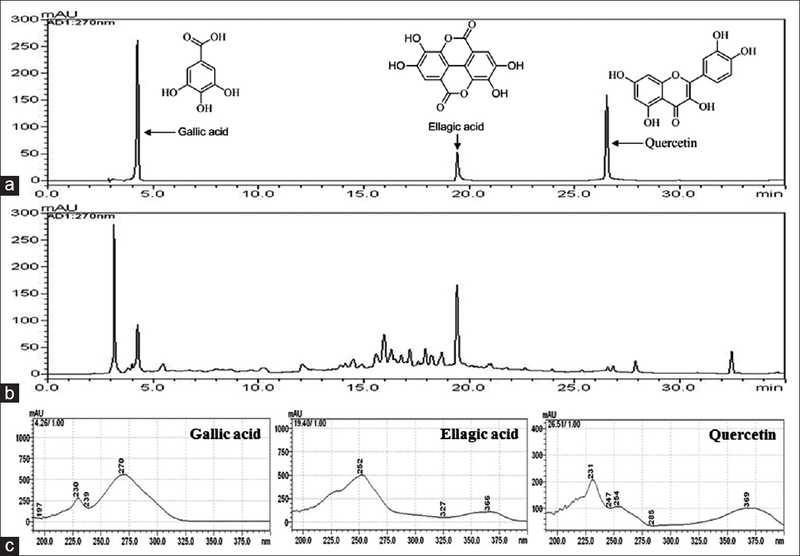 Objective: In this study, we established novel high-performance liquid chromatography (HPLC)-diode array detection analysis method of chlorogenic acid and hyperoside for quality control of Crataegi fructus. 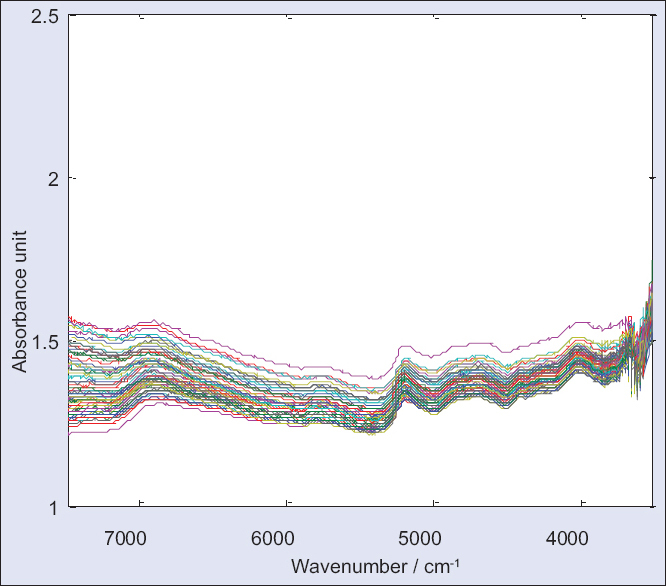 Materials and Methods: HPLC analysis was achieved on a reverse-phase C18 column (5 μm, 4.6 mm × 250 mm) using water and acetonitrile as mobile phase with gradient system. The method was validated for linearity, precision, and accuracy. About 31 batches of Crataegi fructus samples collected from Korea and China were analyzed by using HPLC fingerprint of developed HPLC method. Then, the contents of chlorogenic acid and hyperoside were compared for quality evaluation of Crataegi fructus. Results: The results have shown that the average contents (w/w %) of chlorogenic acid and hyperoside in Crataegi fructus collected from Korea were 0.0438% and 0.0416%, respectively, and the average contents (w/w %) of 0.0399% and 0.0325%, respectively. 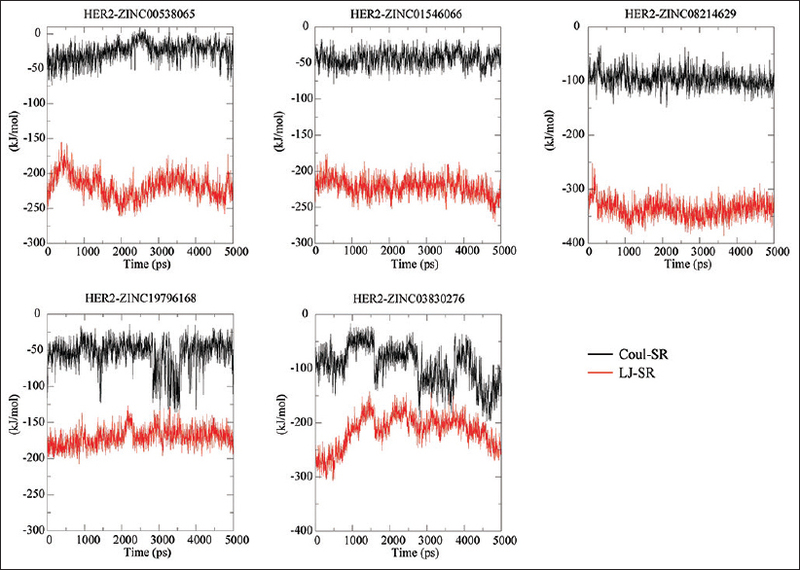 Conclusion: In conclusion, established HPLC analysis method was stable and could provide efficient quality evaluation for monitoring of commercial Crataegi fructus. Background: Radix Sanguisorbae has long been used to treat diarrhea, enteritis, duodenal ulcers, and internal hemorrhage. Objective: We investigated the in vitro anti-inflammatory effects of Radix Sanguisorbae and performed quantitative analyses of three marker components, namely gallic acid, ellagic acid, and quercetin, using high-performance liquid chromatography coupled with a photodiode array detector. Materials and Methods: The three marker components were separated using a reversed-phase Gemini C18 analytical column maintained at 40°C by the gradient elution with two solvent systems. We examined the biological effects of the three marker compounds, gallic acid, ellagic acid, and quercetin, by determining their anti-inflammatory activities in the murine macrophage cell line RAW 264.7. Results: All of the marker compounds exhibited inhibitory effects on prostaglandin E2 production in lipopolysaccharide (LPS)-stimulated RAW 264.7 macrophages, with no cytotoxicity. Particularly, ellagic acid significantly inhibited production of the proinflammatory cytokines tumor necrosis factor alpha and interleukin-6 in LPS-treated RAW 264.7 cells. Conclusion: Our results suggest that ellagic acid is the most potent bioactive phytochemical component of radix Sanguisorbae in the treatment of inflammatory diseases. Background: Dianthus superbus L. has been used in Chinese herbal medicine as a diuretic and anti-inflammatory agent. Objective: In this study, we isolated ten bioactive compounds from D. superbus and evaluated their neuroprotective activity against glutamate-induced cell death in the hippocampal neuronal HT22 cells. Materials and Methods: New compound, (E)-methyl-4-hydroxy-4-(8a-methyl-3-oxodecahydronaphthalen-4a-yl) (1) and, nine known compounds, diosmetin-7-O (2'',6''-di-O-α-L-rhamnopyranosyl)-β-D-glucopyranoside (2), 4-hydroxy-3-methoxy-pentyl ester benzenepropanoic acid (3), vanillic acid (4), 4-hydroxy-benzeneacetic acid (5), 4-methoxybenzeneacetic acid (6), (E)-4-methoxycinnamic acid (7), 3-methoxy-4-hydroxyphenylethanol (8), hydroferulic acid (9), and methyl hydroferulate (10), were isolated by bioactivity-guided separation. 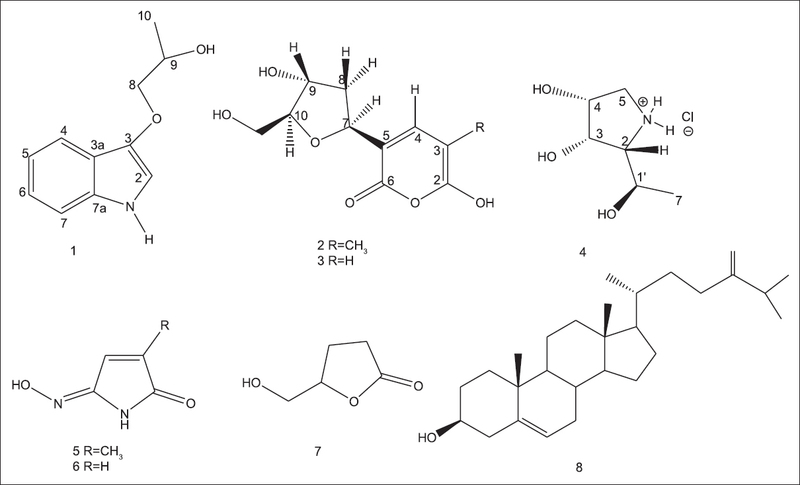 Structures of the isolated compounds were identified on the basis of 1H nuclear magnetic resonance (NMR), 13C NMR, and two-dimensional NMR spectra, while their neuroprotective properties were evaluated by performing the 3-(4,5-dimethylthiazol-2-yl)-2,5-diphenyltetrazolium bromide assay. Results: D. superbus extract had a neuroprotective effect and isolated 10 compounds. Among the compounds, compounds 5 and 6 effectively protected HT22 cells against glutamate toxicity. Conclusion: In conclusion, the extract of D. superbus and compounds isolated from it exhibited neuroprotective properties, suggesting therapeutic potential for applications in neurotoxic diseases. Background: A great number of novel compounds with rich chemical diversity and significant bioactivity have been reported from Red Sea sponges. Objective: To isolate, identify, and evaluate the cytotoxic activity of the chemical constituents of a sponge belonging to genus Haliclona collected from the Eastern coast of the Red Sea. Materials and Methods: The total ethanolic extract of the titled sponge was subjected to intensive chromatographic fractionation and purification guided by cytotoxic bioassay toward various cancer cell lines. The structures of the isolated compounds were elucidated using spectroscopic techniques including one-dimension and two-dimension nuclear magnetic resonance, mass spectrometry, ultraviolet, and infrared data, as well as comparison with the reported spectral data for the known compounds. X-ray single-crystal structure determination was performed to determine the absolute configuration of compound 4. The screening of antiproliferative activity of the compounds was carried on three tumor cell lines, namely the human cervical cancer (HeLa), human hepatocellular carcinoma (HepG2), and human medulloblastoma (Daoy) cells using MTT assay. Results: This investigation resulted in the isolation of a new indole alkaloid, 1-(1H-indol-3-yloxy) propan-2-ol (1), with the previously synthesized pyrrolidine alkaloid, (2R, 3S, 4R, 5R) pyrrolidine-(1-hydroxyethyl)-3,4-diol hydrochloride (4), isolated here from a natural source for the first time. In addition, six known compounds tetillapyrone (2), nortetillapyrone (3), 2-methyl maleimide-5-oxime (5), maleimide-5-oxime (6), 5-(hydroxymethyl) dihydrofuran-2 (3H)-one (7), and ergosta-5,24 (28)-dien-3-ol (8) were also identified. Most of the isolated compounds exhibited weak cytotoxic activity against HepG-2, Daoy, and HeLa cancer cell lines. Conclusion: This is the first report of the occurrence of the indole and pyrrolidine alkaloids, 1-(1H-indol-2-yloxy) propan-2-ol (1), and the - (1-hydroxyethyl)-3,4-diol hydrochloride (4), in the Red Sea Haliclona sp. Background: Peroxisome proliferator-activated receptors (PPAR)-γ is widely used as an attractive target for the treatment of type 2 diabetes mellitus. Thiazolidinediones, the agonists of PPARγ, has been popularly utilized as insulin sensitizers in the therapy of type 2 diabetes whereas numerous severe side-effects may also occur concomitantly. Objective: The PPARγ activation activity of different polar extracts, including petroleum ether, ethyl acetate, n-butanol, residual of ethanol, the precipitate part of water and the supernatant of water extracts, from 37 traditional Chinese medicines were systematically evaluated. Materials and Methods: HeLa cells were transiently co-transfected with the re-constructed plasmids of GAL4-PPARγ-ligand binding domain and pGL4.35. 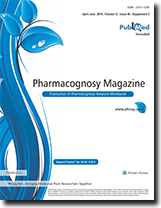 The activation of PPARγ by different polarity extracts were evaluated based on the PPARγ transactivation assay and rosiglitazone was used as positive control. Results: Seven medicines (root bark of Lycium barbarum, Anoectochilus sroxburghii, the rhizome of Phragmites australis, Pterocephalus hookeri, Polygonatum sibiricum, fruit of Gleditsia sinensis, and Epimedium brevicornu) were able to significantly activate PPARγ. Conclusion: As seven medicines were able to activate PPARγ, the anti-diabetic activity of them is likely to be mediated by this nuclear receptor. Background: Many plants possess antioxidants that exhibit additive or synergistic activities. 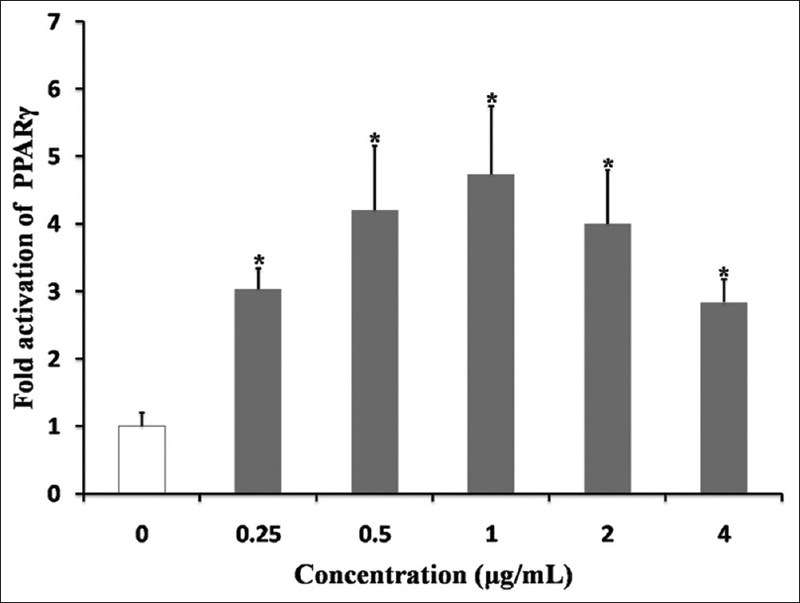 Objective: In this study, an ethanol-extracted flavonoid extracted from mulberry fruit (FEM) was evaluated for the antioxidant activity in vitro and the hemolysis in red blood cell (RBC) and lipid peroxidation in liver in vivo. Materials and Methods: Antioxidant activities in vitro were measured by quantifying its 2,2-diphenyl-1-picrylhydrazyl (DPPH) scavenging activity, reducing power, and Fe2+-chelating ability. 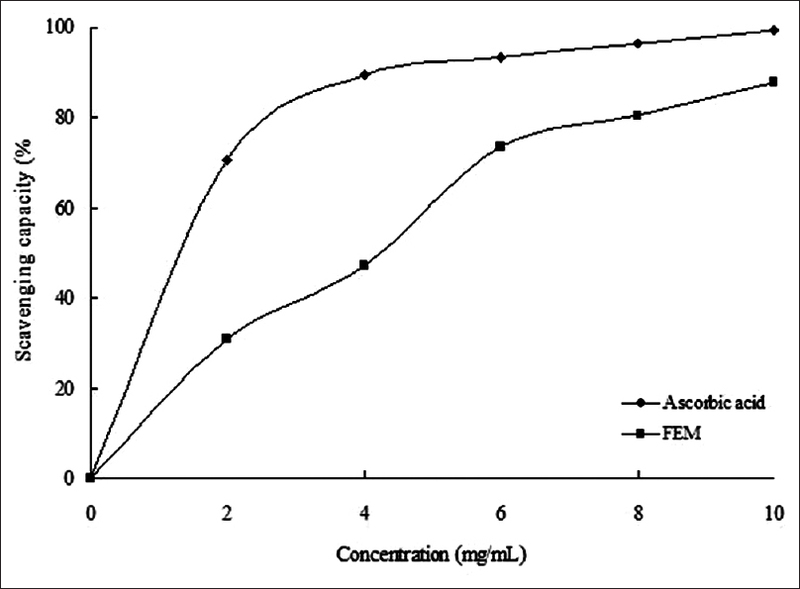 FEM inhibits hemolysis in RBCs and effects of lipid peroxidation in the liver were estimated. Results: The total content of flavonoid compounds was 187.23 mg of quercetin equivalents per grams dried material. In the in vitro assays, FEM demonstrated a strong antioxidant effect, especially in DPPH scavenging activity and reducing power. Mouse RBC hemolysis induced by H2O2was significantly inhibited by FEM in a dose- and time-dependent manner. The effects of FEM on lipid peroxidation in liver, mitochondria, and microsome were investigated. The percentage of inhibition at high concentration (100 μg/mL) of FEM was 45.51%, 39.36%, and 42.78% for liver, mitochondria, and microsomes, respectively. These results suggest that the FEM possesses a strong antioxidant activity both in vivo and in vitro. Background: Yinqiaosan (Lonicerae and Forsythiae Powder), as a famous prescription of Dr. Wu Jutong in Qing dynasty of China, has the effects of diaphoresis cooling, fire-purging, and detoxicaton. It is mainly used in the treatment of influenza, hand-foot-mouth disease, esophagitis, pneumonia, acute tonsillitis, mumps, and other viral infections. It is one of the widely used traditional Chinese medicine prescriptions with proven curative effects in clinical use. Objective: To research the material basis of Yinqiaosan decoction when decocting mint, herba schizonepetae in different length of later-decoction time, to find the influence on volatile components of Yinqiaosan decoction decocted later in different length of time, to lay the foundation to further clarify the after-decoction mechanism of Yinqiaosan, and the specification of Yinqiaosan decoction process. Materials and Methods: Gas chromatography mass spectrometry method is used to analyze the volatile components of Yinqiaosan decoction samples decocted for 0, 3, 5, 8, and 10 min. Results: Later-decocting mint and herba schizonepetae at different time when decocting Yinqiaosan had a significant influence on the volatile components of the solution. 54 different chemical components were identified: 25 were identified when later-decocting the sample for 3 min; 13 were identified when later-decocting the sample for 5 min; 11 were identified when later-decocting the sample for 8 min; 7 were identified when later-decocting the sample for 10 min; and 26 were identified when later-decocting the sample for 0 min. 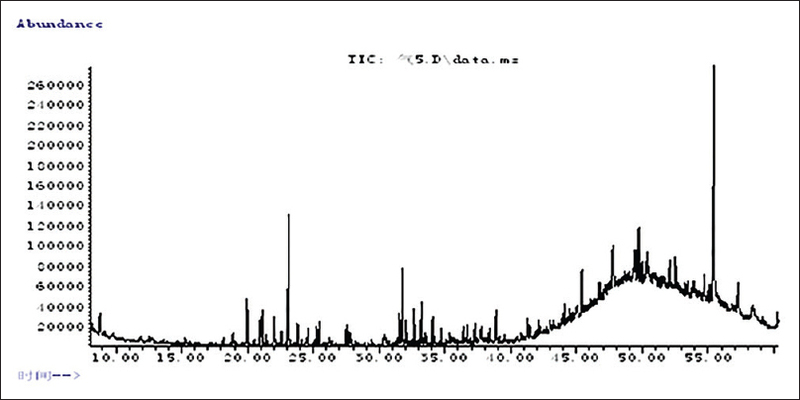 There were more volatile components in the sample after-decocted for 3 min. A total of 54 different chemical components were identified in different later-decocting solution samples. These components form the basis of the Yinqiaosan drug effect. Conclusions: The length of later-decoction time of mint and herba schizonepetae was confirmed to be 3 min when decocting Yinqiaosan. Background: Human epidermal growth factor receptor-2 (HER2) is a trans-membrane receptor like protein, and aberrant signaling of HER2 is implicated in many human cancers, such as ovarian cancer, gastric cancer, and prostate cancer, most notably breast cancer. Moreover, it has been in the spotlight in the recent years as a promising new target for therapy of breast cancer. Objective: Since virtual screening has become an integral part of the drug discovery process, it is of great significant to identify novel HER2 inhibitors by structure-based virtual screening. Materials and Methods: In this study, we carried out a series of elegant bioinformatics approaches, such as virtual screening and molecular dynamics (MD) simulations to identify HER2 inhibitors from Food and Drug Administration-approved small molecule drug as potential “new use” drugs. Results: Molecular docking identified top 10 potential drugs which showed spectrum affinity to HER2. Moreover, MD simulations suggested that ZINC08214629 (Nonoxynol-9) and ZINC03830276 (Benzonatate) might exert potential inhibitory effects against HER2-targeted anti-breast cancer therapeutics. Conclusion: Together, our findings may provide successful application of virtual screening studies in the lead discovery process, and suggest that our discovered small molecules could be effective HER2 inhibitor candidates for further study. Acanthopanax senticosus (Rupr and Maxim) Harms (AS), a member of Araliaceae family, is a typical folk medicinal herb, which is widely distributed in the Northeastern part of China. Due to lack of this resource caused by the extensive use of its root, this work studied the chemical constituents of leaves of this plant with the purpose of looking for an alternative resource. In this work, a fast and optimized ultra-performance liquid chromatography method with quadrupole time-of-flight mass spectrometry (UPLC-QTOF-MS) has been developed for the analysis of constituents in leaves extracts. A total of 131 compounds were identified or tentatively characterized including triterpenoid saponins, phenols, flavonoids, lignans, coumarins, polysaccharides, and other compounds based on their fragmentation behaviors. Besides, a total of 21 metabolites were identified in serum in rats after oral administration, among which 12 prototypes and 9 metabolites through the metabolic pathways of reduction, methylation, sulfate conjugation, sulfoxide to thioether and deglycosylation. The coupling of UPLC-QTOF-MS led to the in-depth characterization of the leaves extracts of AS both in vitro and in vivo on the basis of retention time, mass accuracy, and tandem MS/MS spectra. It concluded that this analytical tool was very valuable in the study of complex compounds in medicinal herb. Background: Oxidative stress (OS) has been regarded as one of the major pathogeneses of ulcerative colitis (UC) through damaging colon. It has been shown that Scutellariae radix (SR) extract has a beneficial effect for the prevention and treatment of UC. Objective: The aim of this study was to investigate whether SR had a potential capacity on oxidant damage for colon injury both in vivo and in vitro. Materials and Methods: The 2,4,6-trinitrobenzene sulfonic acid (TNBS) was used to induce UC rats model while 1 μg/ml lipopolysaccharide (LPS) was for RAW264.7 cell damage. Disease activity index (DAI) was determined to response the severity of colitis. The myeloperoxidase (MPO) activity in rat colon was also estimated. The 2,2'-azino-bis-3-ethylbenzthiazoline-6-sulfonic acid assay was performed to evaluate the total antioxidant capacity of SR. Furthermore, the activity of glutathione peroxidase (GSH-PX), catalase (CAT), superoxide dismutase (SOD), and lipid peroxidation malondialdehyde (MDA) in cell supernatant and rat serum were detected by appropriate kits. In addition, an immunohistochemical assay was applied to examine transforming growth factor beta 1 (TGF-β1) protein expression in colon tissue. 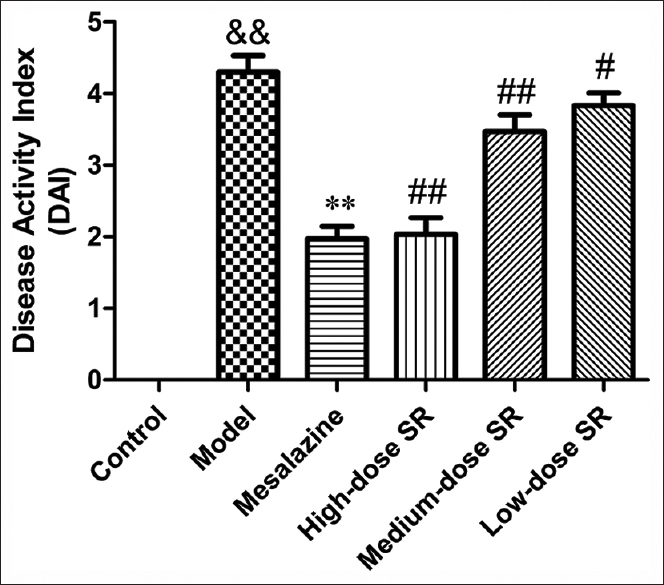 Results: The treatment with SR could significantly increase the activity of GSH-PX, CAT, and SOD associated with OS in LPS-induced RAW264.7 cell damage and TNBS-induced UC rats. However, the level of MDA was markedly reduced both in vitro and in vivo. Furthermore, SR significantly decreased DAI and reversed the increased MPO activity. Thus, SR could decrease the severity of acute TNBS-induced colitis in rats. Immunohistochemical assay showed that SR significantly downregulated TGF-β1 protein expression in colon tissue. Conclusion: Our data provided evidence to support this fact that SR attenuated OS in LPS-induced RAW264.7 cell and also in TNBS-induced UC rats. Thus, SR may be an interesting candidate drug for the management of UC. Background: Herpes simplex virus type 1 (HSV-1) is associated with orofacial infections and is transmitted by direct contact with infected secretions. Several efforts have been expended in the search for drugs to the treatment for herpes. Schinus terebinthifolius is used in several illnesses and among them, for the topical treatment of skin wounds, especially wounds of mucous membranes, whether infected or not. 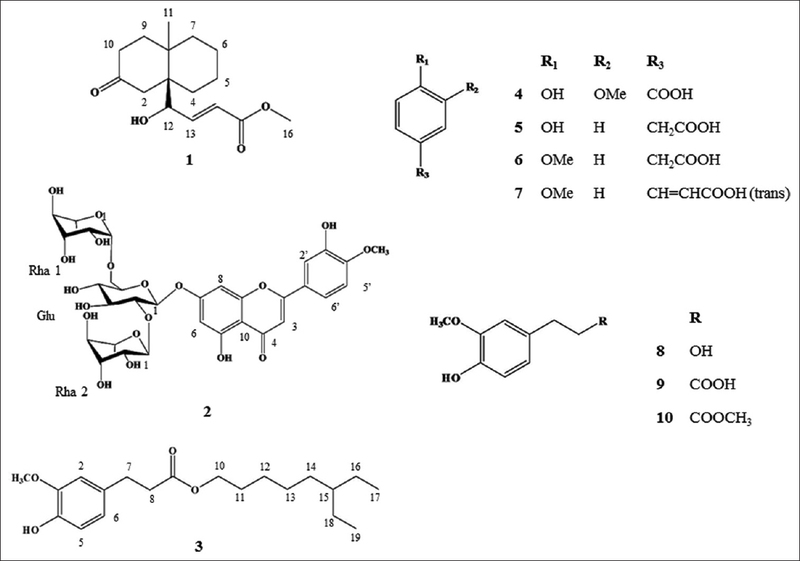 Objective: To evaluate the cytotoxicity and anti-HSV-1 activity of the crude hydroethanolic extract (CHE) from the stem bark of S. terebinthifolius, as well as its fractions and isolated compounds. Materials and Methods: The CHE was subjected to bioguided fractionation. The anti-HSV-1 activity and the cytotoxicity of the CHE, its fractions, and isolated compounds were evaluated in vitro by SRB method. A preliminar investigation of the action of CHE in the virus–host interaction was conducted by the same assay. Results: CHE presented flavan-3-ols and showed anti-HSV-1 activity, better than its fractions and isolated compounds. The class of substances found in CHE can bind to proteins to form unstable complexes and enveloped viruses, as HSV-1 may be vulnerable to this action. Our results suggest that the CHE interfered with virion envelope structures, masking viral receptors that are necessary for adsorption or entry into host cells. Conclusion: The plant investigated exhibited potential for future development treatment against HSV-1, but further tests are necessary, especially to elucidate the mechanism of action of CHE, as well as preclinical and clinical studies to confirm its safety and efficacy.